Recently I had the chance to visit the Sarah Orne Jewett House in South Berwick. I learned so much during my visit that was guided by Julia Einstein, Education Program Coordinator for Maine at Historic New England. 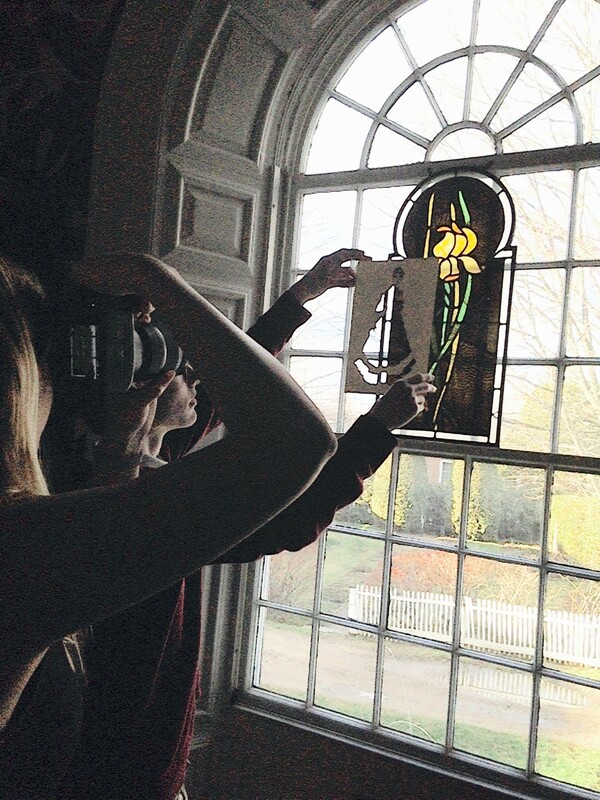 Julia has kindly provided this blog post so you can learn about the collaborative work that happened between Berwick Academy art and music students under her guidance and those of the schools art and music teachers. At the bottom of the post you will find information on Historic New England. The creative collaboration between nineteenth century visual artists and author Sarah Orne Jewett was the inspiration for Make History: Community as Classroom. This interdisciplinary project was a mixing of media—arts + literature + history—and a way to delve into innovation, and how ideas are made. The concept “classroom in the museum” translated in the way high school students were able to self-select spaces in the Sarah Orne Jewett House Museum to study, sketch, write, read passages from a Sarah Orne Jewett story or novel, and to practice a piece of period music. 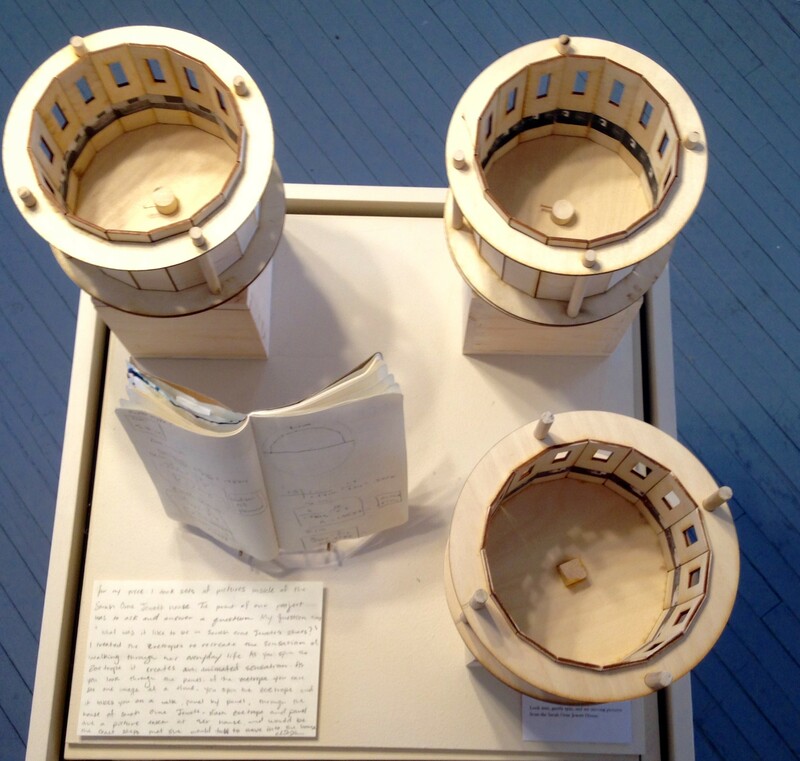 An exhibition came as a result of this collaborative learning experience between myself, at Historic New England, and Berwick Academy Arts Faculty Raegan Russell and Seth Hurd. Marilyn Keith Daley, Site Manager at the Sarah Orne Jewett House, used the work synergy in describing the project and it fits. She and I saw this as a way to bring a contemporary energy to a visitor’s tour of Sarah Orne Jewett’s House. Jewett invited artists Marcia Oakes Woodbury and Charles Woodbury into her home to work out the sketches for what became the illustrations for her novel, Deephaven. This allowed for the Woodburys to become immersed in –to fall in love with—the subject in the pages of her novel. They sketched onsite—as did the students of Berwick Academy –and they came to know this house—this main character of her novel. 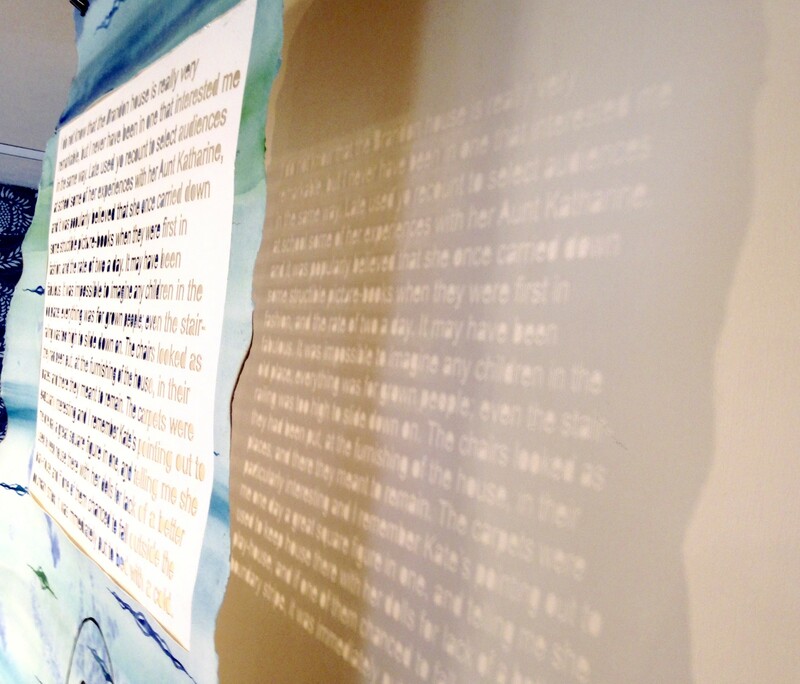 Students in Studio Art Honors, Advanced Placement Art, and Chamber Chorus were inspired to create personal meanings in the story of the Sarah Orne Jewett House in both visual and performance-based interpretations. In the exhibition, visitors see the time it took for an idea to evolve. They are able to search through the very same sketchbooks used by the students on their visits to the Jewett House to look for connections with their final work. Student statements, written in long hand as Jewett wrote the manuscripts of her novels, bring the artist’s voice into the gallery. 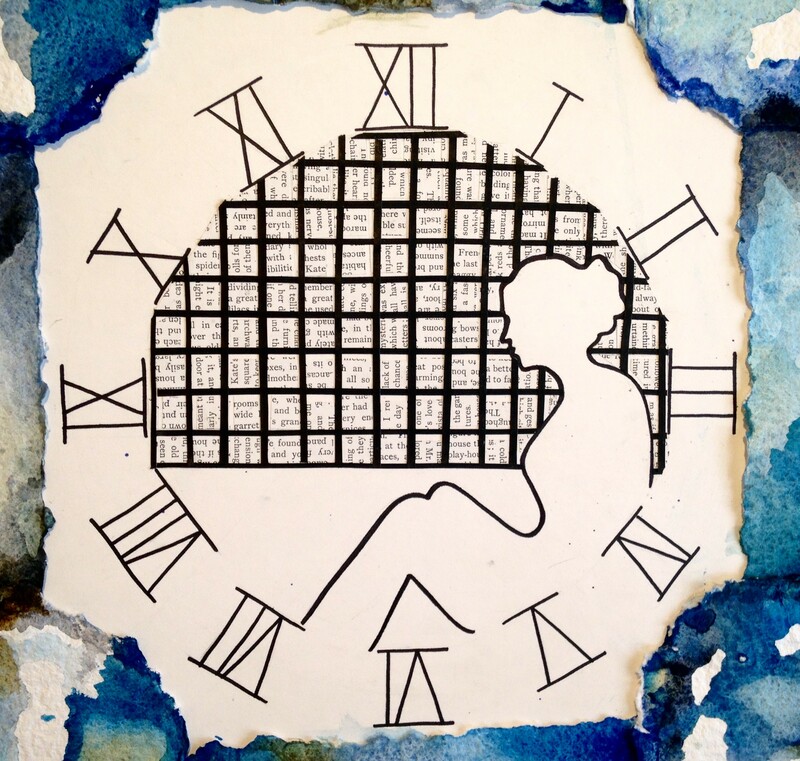 In the art classroom, the question “How can artists interpret time through visual means?” led sketchbook exploration, and the creation of a small body of work in a selected media. In the music classroom, the Chamber Chorus explored a piece written in the same decade as Jewett’s novel, Deephaven. They recorded the period piece in the Jewett house for visitors to listen, to imagine the year 1893, and to be transported to a parlor performance. In the exhibition, a paper sculpture—made from pages copied from a Jewett book—is a dreamy walk in paper shoes on a tufted surface because the artist saw the knobbed bedspread knots in Jewett’s bedroom. Another student saw the same bedroom, yet is interested in what you do not see—intimate, casual images, unlike posed photographs of Jewett, The artist paints you into one—of waking in her bed and looking out the window. In another work, it is about how your eyes adjust to light and movement of 19th century invention, an optical amusement, in 3 beautifully constructed zoetropes. There is an exploration into what is modern. What was modern then—the newness and excitement of cobalt blue in wallpaper—what is modern now? 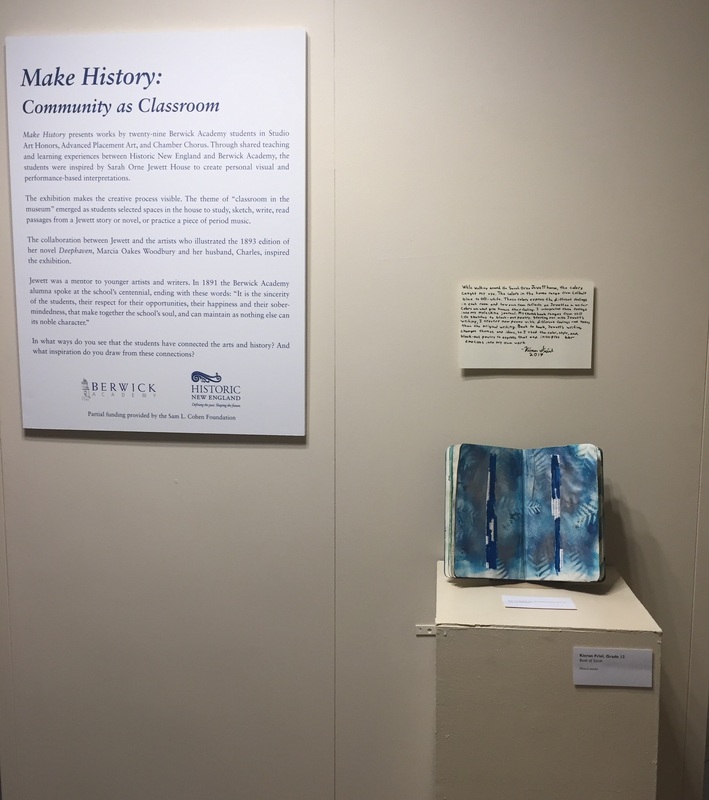 The exhibition Make History: Community as Classroom was funded in part with a grant from the Sam L. Cohen Foundation. 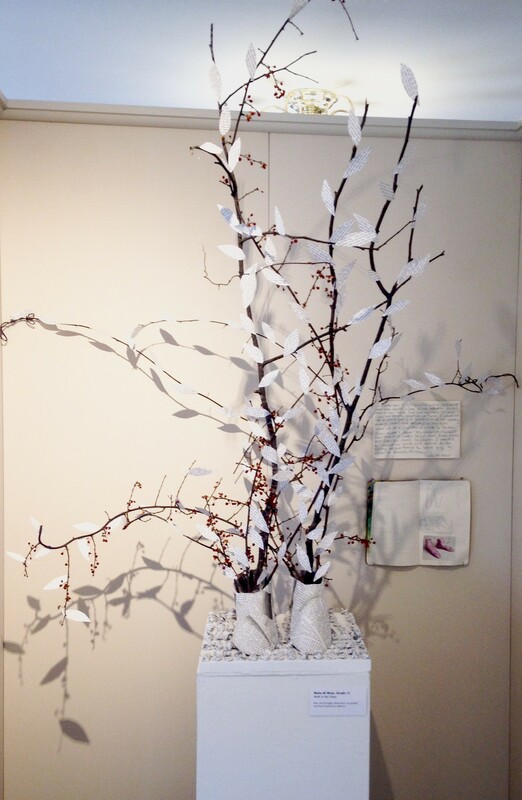 It is currently on view for one more weekend at the Sarah Orne Jewett House Museum and Visitor Center in South Berwick, Maine, through Saturday, May 6. Hours are from 11 a.m. – 5 p.m. For more information, call 207-384-2454, or CLICK HERE. Sarah Orne Jewett House Museum and Visitor Center is one of 36 house museums owned and operated by Historic New England, the oldest, largest, and most comprehensive regional heritage organization in the country. Historic New England is devoted to education, making connections in the communities, and offering unique opportunities to experience the lives and stories of New Englanders through their homes and possessions.